Next postImprovingBirth.org – A rally for change!!! I was observing a classroom of Upper El students during my training and the deep frustration that the two girls I was sitting closest to almost brought me to tears. The guide did a whole group presentation on the puzzle maps and these girls ended up with Africa. They were into not just doing the puzzle for the puzzle’s sake (they aren’t in Casa after all ). They were looking up names and capitals. (I helped them with pronunciation of a few.) They had one more piece to put into the puzzle when the guide called time and wouldn’t let them complete the work. Apparently no work is left out to return to. One piece – two minutes. It was awful. Really, age appropriate lessons and time to work to completion are critical for the love of learning. I can imagine how frustrated you (and they) felt! I observed at several schools in Europe and there were constant interruptions, so nothing got done, the children were rowdy, and the teachers were frustrated. So many issues could be avoided by simply respecting a child’s concentration! There’s lots of interesting research on this topic in the book “Montessori: The Science behind the genius” by Lillard. Thanks for reading! I find the idea of homeschooling using Montessori a bit in conflict with the whole methodology. While there can be no question that the materials are wonderful and the philosophy applies to all aspects of the child’s life, you cannot diminish the role of the mixed aged classroom. 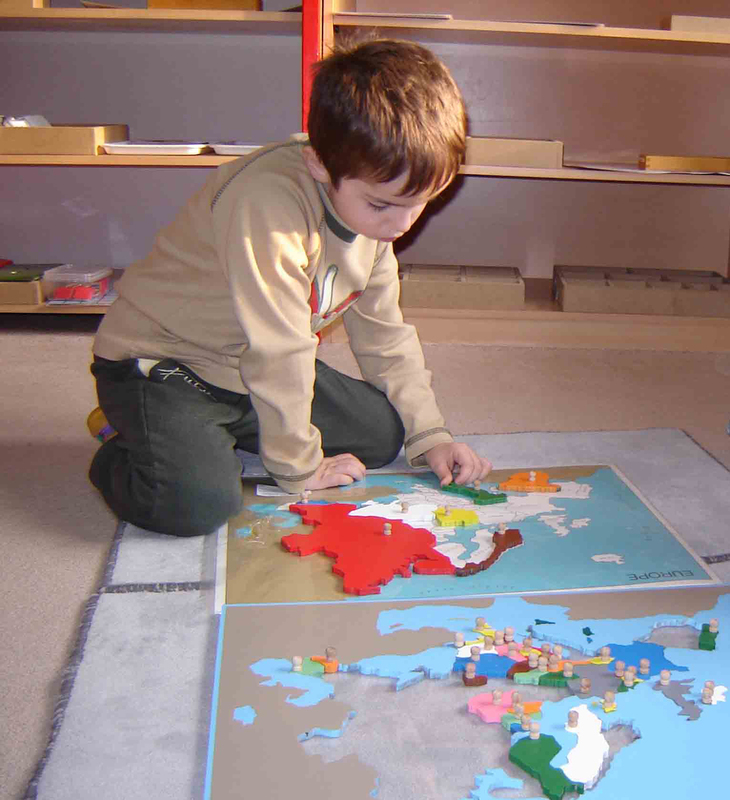 The synergy created really makes Montessori education come to fruition. I am a certified Montessori teacher and have had a small daycare of 5 children in my home and have taught in classrooms. While both can work, there is a big difference. Best to all! Thank you for explaining and highlighting the importance of the work cycle with such depth and clarity. I was browsing through the comments and I agree with Sally that interactions from being in a mixed age group matters. However, I have chosen to homeschool partially due to financial constraints. Authentic montessori schools are hard to come by and when they do, it comes with a hefty price tag. So what suggestions do you have for a family who would like to homeschool the montessori way? Have a three hour work cycle in the mornings, then playdates, music classes etc in the afternoons? My child is 4. Yes, totally!! But work up to it, your child might not be used to so much independence. A new classroom NEVER starts off with a 3-hr work period, and neither should a new homeschool environment. Follow your child, mix up independent work with reading a story together or doing work in the kitchen, until little by little he’s working independently for the entire 3 hours. This could take weeks, months, or even a year. Be patient! Hi Ana, I’m sorry I didn’t reply, I’ve been busy with our new baby! PLEASE feel free to post or publish anything you find helpful on this blog, all I ask is that you credit me and if possible link back to this blog. Thanks! Our school has been in existence since January 2015. We have three environments from ages 3 -12. #1 the recruits are, more often than not, mainstream thinkers between 6-12. #2 the parent’s and department of education’s expectations to prepare them for the mainstream school that they might be going to afterwards. I.e. Assesment-based teaching. #3 as a result, during the uninterrupted work cycle some of the kids who are not normalised prefer to be told what to do as they have not developed the muscles for working independently of the guide, yet. This disrupts the cycle continuously. Thanks for the open forum. I teach in a 6-9yrs Montessori class and really struggle with the three hour work cycle. As children of this age tend to herd a lot more than the younger ones if they have the freedom to break whenever they choose it ends up a whole class break! Morning tea times are now set in rostered groups and as a result the children seem to just wait for their turn as soon as the first group go, watching the clock, and so they are not focussed on their work at all. If I set just 4 seats and children can go when they feel ready it is like a race… Children eagerly watching the tables and jumping when there is a free space! The three hour work cycle is broken with language or math presentations that children must come to. If they have the choice not to attend then lessons back up and I run out of time to present them. 15 min Fitness must also take place in the morning work cycle and needs to be done as a whole class activity to ensure adequate supervision and duty of care. Again if children were able to head out for fitness at their own discretion the whole class would herd and break the cycle! The children are expected to independently complete a math revision task and a daily mental math page each morning also. We are currently looking at implementing a language program that is a 45 min lesson every morning, this would be on top of the language or math presentation already given. This totals over an hour and a half of the morning work cycle effectively teacher directed. This doesn’t include the completion of daily math revision, guided reading or catch up lessons. The three hour morning work cycle has been my biggest struggle to date. I would love any suggestions. There’s really no way for the 3-hr cycle to work if the administrators keep inserting “external” programs/specialists into the morning. For it to work, EVERYTHING should be integrated into the work cycle, including fitness, language, math, science, music, drama, etc. Why not start the morning with group fitness, get it over with and move on to the morning work cycle? And get rid of tea time. Children at that age don’t need food between breakfast and lunch. If they can’t handle the privilege of tea time, get rid of it. It sounds to me like the children are “herding” because they are feeling too controlled and not being given enough freedom. Children will herd if they feel that whatever the other people are doing is more interesting than what they are doing. But if they are being offered interesting work, they won’t care what anyone else is doing. So re-evaluate your lessons, your follow-ups, your stories to see if they are catching the children’s interest. Hope that helps! Could you maybe speak to “work plans” in primary? My daughter’s school has implemented work plans for the kindergarten aged kids to “prepare them for lower elementary”. This seems contradictory to the independent works idea.